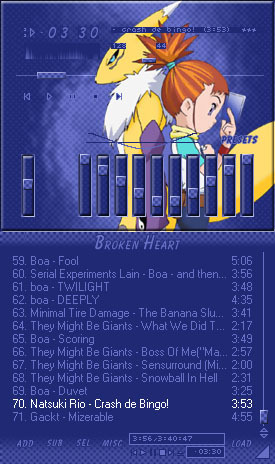 This is just a little collection of Winamp Skins I've made. I haven't made a lot. 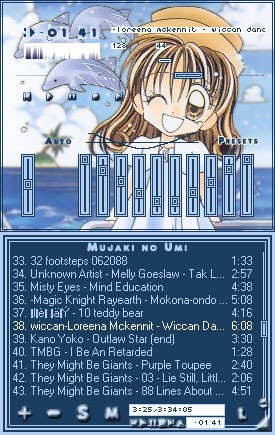 If you want to put one on your site, Email me first, with the name of the winamp skin you want to put on your site, and your site name, and wait till I reply before puting it on you site. I will reply ASAP. Please do not steal them and claim them as your own, I have worked hard on these skins. I don't use any skin program to make them, just photoshop 6.0. 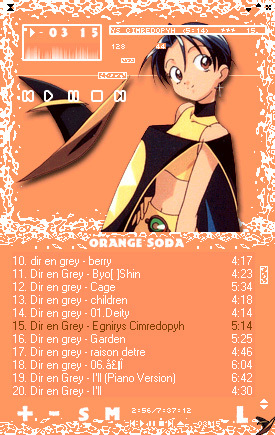 These winamp skins aren't divided into catagories because I thought there was no purpose since there's not many. 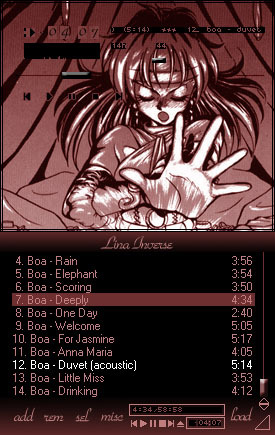 Comment: This was the first Winamp skin I made. Hayashibara-sama is the best! I love her to pieces. Comment: I really love the original picture, its very pretty. It looks best against light colors, but it looks fine against dark. I had a little KKJ obsession when I made this. Comment: I made this for my friend, Jake, even though I've never seen this anime. 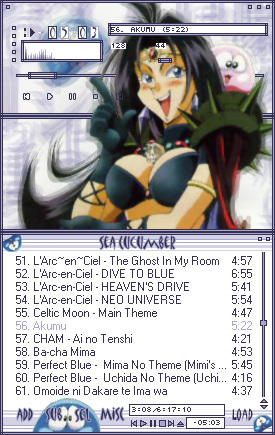 And I refuse to watch the dub, since the digimon dubs are horible XP. Oh well, I really like the way this one turned out. Comment: Naga is the most hilarious character in Slayers! And she has the best laugh ever! I like the way this skin turned out, and I really love the playlist XD. OH HO HO HO HO HOO!!!!! Comment: Nanaka is the kewlest!! This skin is very.......orange, lol. This would be a good halloween skin o.~ lol. Comment: I love Xellos! Is there any Slayers character I don't love? 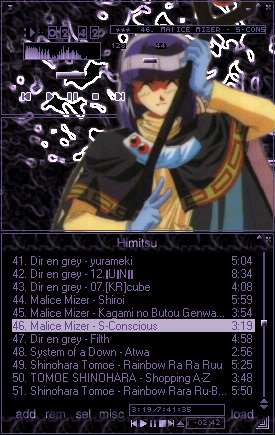 I couldn't think of anything to name it, I thought Himitsu was appropriate =P. Comment: I am in love with this skin. 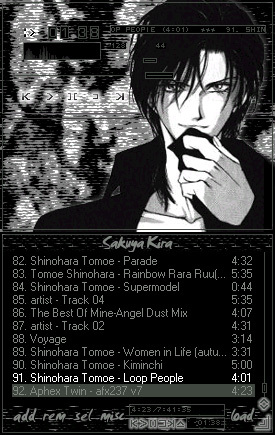 Kira is my favorite character in Angel Sanctuary XD!